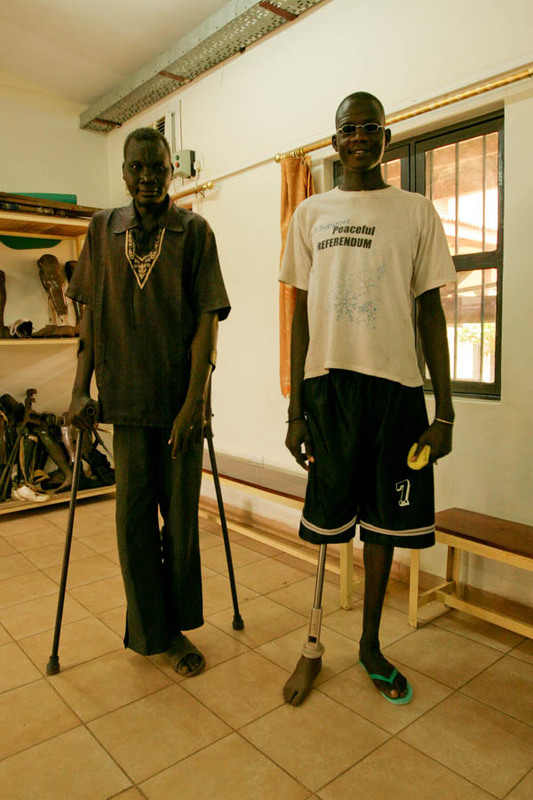 South Sudan is home to many thousands of landmines and guns. 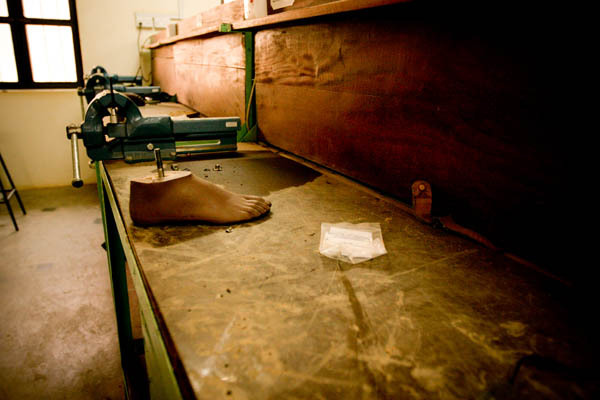 As a result, there are many landmine and gunshot injuries. 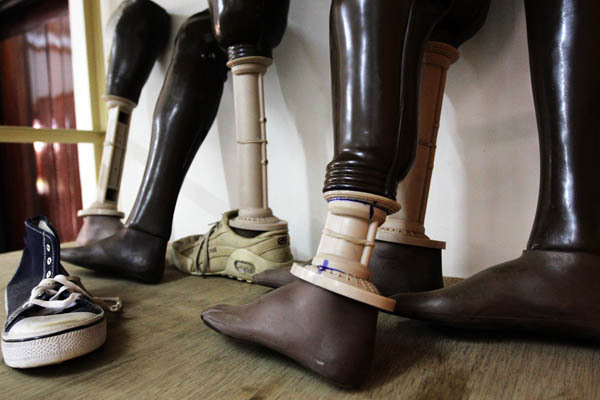 In Juba, the Physical Rehabilitation Reference Centre was set up by the International Committee of the Red Cross (ICRC) and is run jointly with the Southern Sudan Ministry of Gender, Child and Social Welfare to make prosthetic legs and train South Sudanese amputees how to use them. 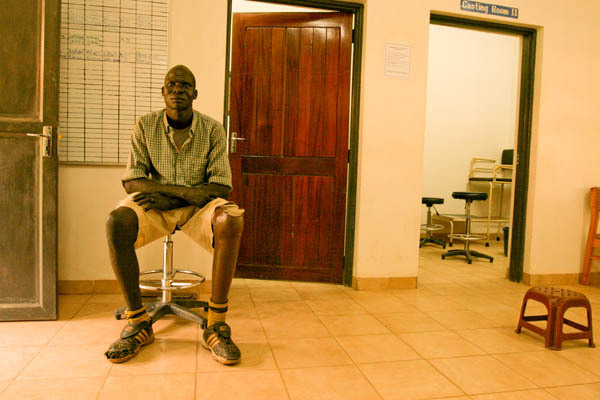 The centre is staffed mostly by South Sudanese who have undergone various types of training, along with four people from ICRC with significant experience in this kind of work. My friend Sam and I were invited to visit the centre to learn more about the process involved in addressing an individual’s needs after he or she has lost a leg. The centre is very well-organised, the staff are knowledgeable and friendly, and the patients were quick to smile when they saw my camera, so I took a few photos as we walked around. 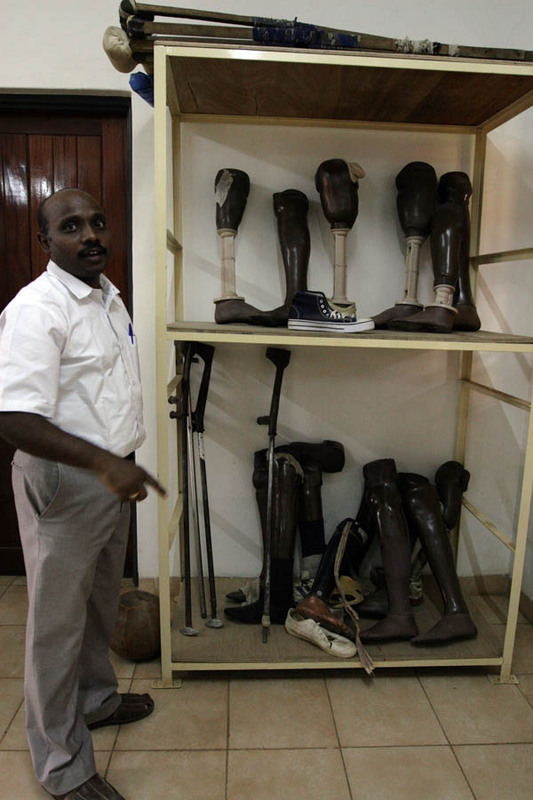 Suresh is a physiotherapist, so he spends a lot of time in the gait training room, where patients learn to walk with their prosthetic legs. 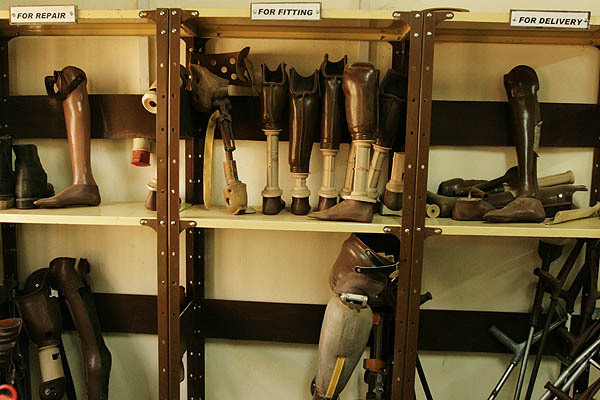 While patients walk up and down the room, staff observe and take notes, and the prosthetics are adjusted and re-adjusted until they suit the patients. 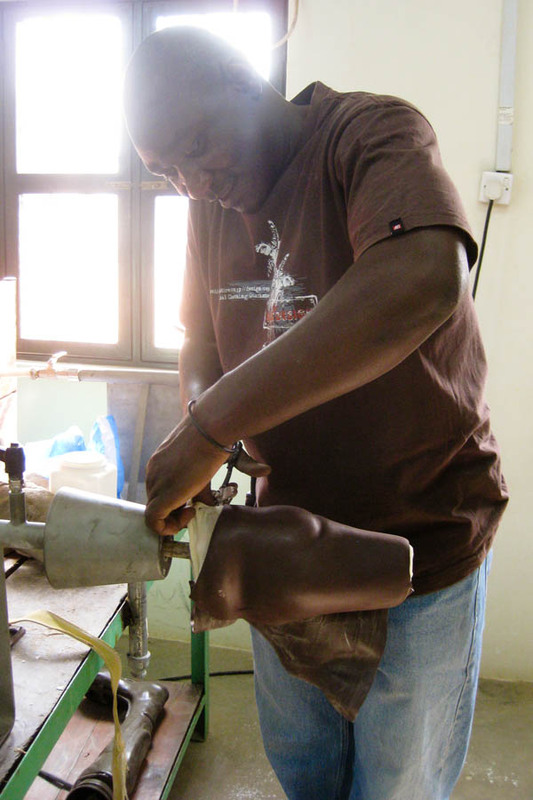 Once the artificial leg is correctly adjusted for a patient, the cosmetic part of the new leg can be fitted over the functional parts. 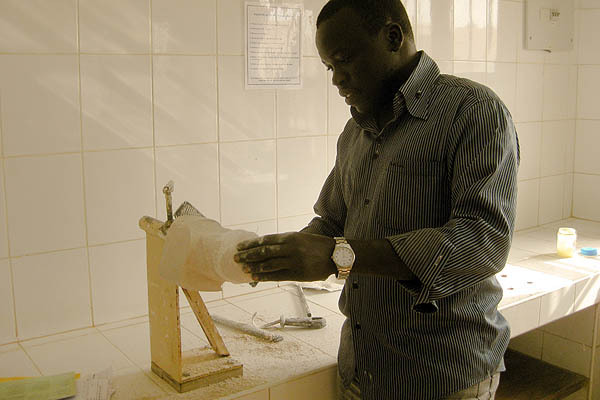 Antero, a prosthetics specialist, shows Sam how PVC plastic is molded on plaster casts. 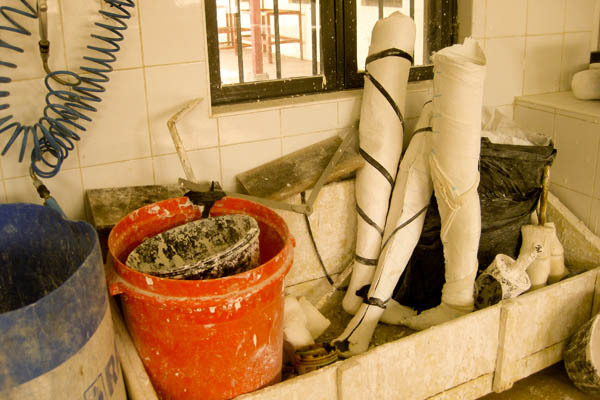 A flat sheet of hard plastic is heated in a pizza oven (the industry standard) until soft, then wrapped around a plaster cast of part of a patient’s leg. During fitting, the patient tries out the leg, and adjustments are made by loosening bolts then adjusting the angles of the components (see the blue ink on the leg in the foreground below, where the angles can be changed). 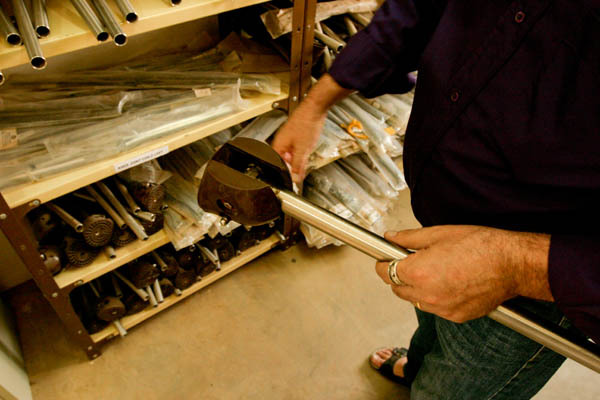 The functional part of an above-the-knee prosthetic leg includes a simple joint connected to a metal rod which then connects to a plastic foot. The knee seen below would need to be connected to a molded piece of plastic into which the leg stump fits. 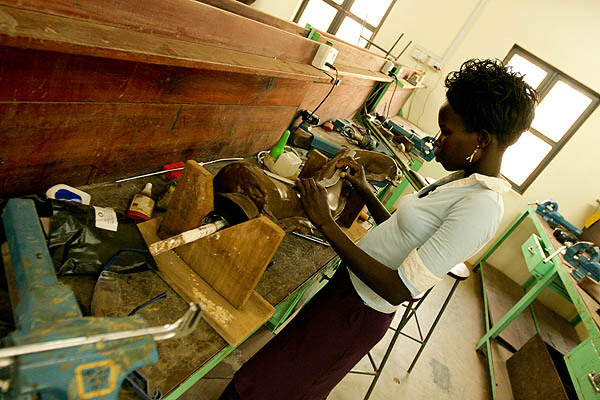 This entry was posted in Africa, Humanitarian, South Sudan and tagged ICRC, Juba.